The Chiefs and their fans are riding high after locking up the top seed in the playoffs. Monday, a current and former player kept the celebration going with an early New Year's Eve party at the Don Bosco Senior Center. This partnership between the Chiefs and the center has evolved over the past dozen years. Lately, the Chiefs participate in a New Year’s Eve celebration with a game of bingo full of Chiefs prizes and a toast of sparkling grape juice. KANSAS CITY, Mo. — The Chiefs and their fans are riding high after locking up the top seed in the playoffs. Monday, a current and former player kept the celebration going with an early New Year's Eve party at the Don Bosco Senior Center. This partnership between the Chiefs and the center has evolved over the past dozen years. 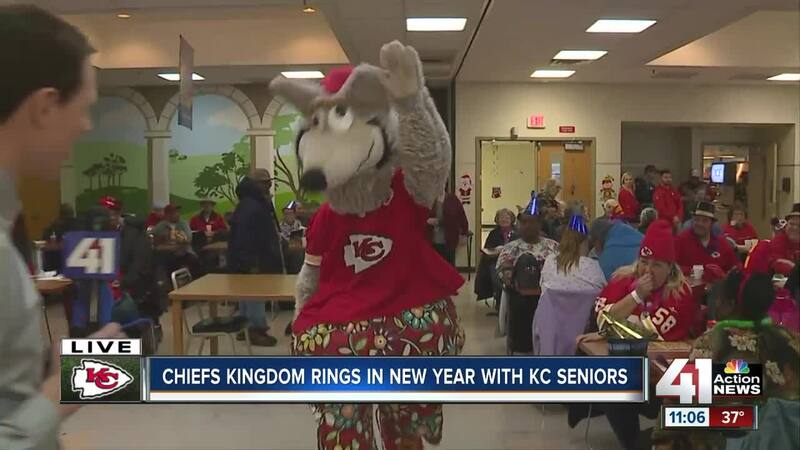 Lately, the Chiefs participate in a New Year’s Eve celebration with a game of bingo full of Chiefs prizes and a toast of sparkling grape juice. The Don Bosco Senior Center was full of fans decked out in red to greet Jan Stenerud, Harrison Butker, KC Wolf and cheerleaders Monday morning. Stenerud won a Super Bowl with the Chiefs and became the first placekicker inducted into the NFL Hall of Fame. Butker is in his second season with the Chiefs. The two kickers had met previously but shook hands and said hello upon arriving at the center. Stenerud said he doesn’t think Butker needs any advice as the Chiefs move through the playoffs. “He's doing great. He's one of the finest kickers I've seen. And I've been watching for 50-something years. He needs to do exactly what he's doing," Stenerud said. Butker called the statement flattering. He admitted he learns something from Stenerud every time they meet and Butker always feels like he can improve. “Jan obviously is a Hall of Fame placekicker and an amazing guy on the field and off the field. I’m always glad to spend some time with him and learn some things about kicking. I love it. The fact that he's here makes me want to be here even more,” Butker said. Both men said the current Chiefs team is in a great position to win a Super Bowl thanks to guaranteeing home field advantage throughout the playoffs. "They have a great chance,” Stenerud said. “I think they're the best team in football. Best offensive team in football for sure and the defense has come along. So they have a great chance." "When I first got here everyone was wearing something KC Chiefs or something that was red. It's been amazing. And of course, Arrowhead is rocking every Sunday," Butker praised the fans for inspiring the team to do well. The Chiefs Community Caring Team makes visits like this one to senior centers and schools. The team’s goal is to thank fans, support civic groups, and promote health, wellness and football.